Door County by Hwy 42 in Wisconsin is one of the premier spots for enjoying fall colors. During the peak fall season, any of the country back roads will treat you with a palette of colors, but this crooked road definitely takes the crown. It really is a neat road, connecting the village of Gills Rock, Wisconsin with the Washington Island Ferry dock at Northport. 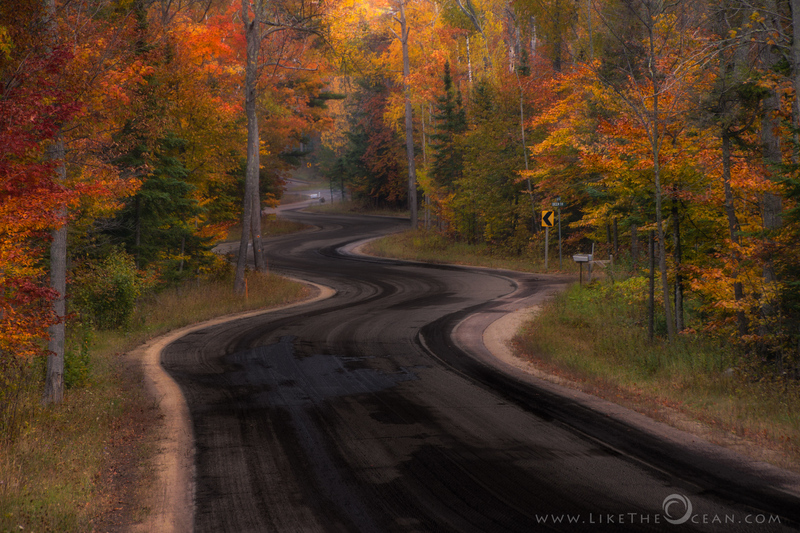 At the right time, this winding stretch of road is encapsulated by a burst of fall colors. Thanks to the ongoing road work during my visit, it added a rustic feel to the shot !!! This time of year….so many colourful surprises just around the corner…….! Lovely fall colors. So picturesque! I love fall colors. Thanks for sharing! Fabulous – both the road and the colours!